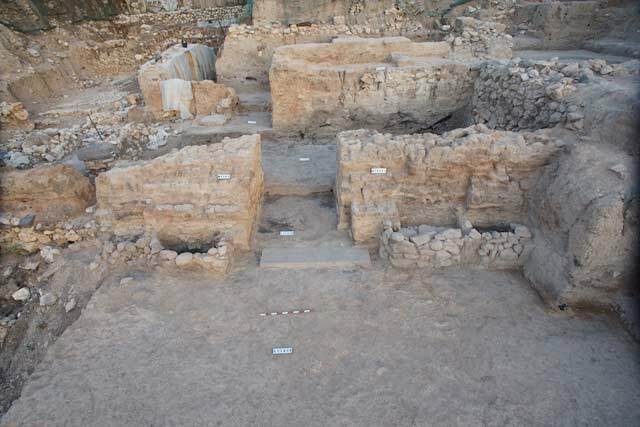 The 28th season of the ‘Selz Foundation Hazor Excavations in Memory of Yigael Yadin’ (License No. G-26/2017) took place during the months of June–July 2017. 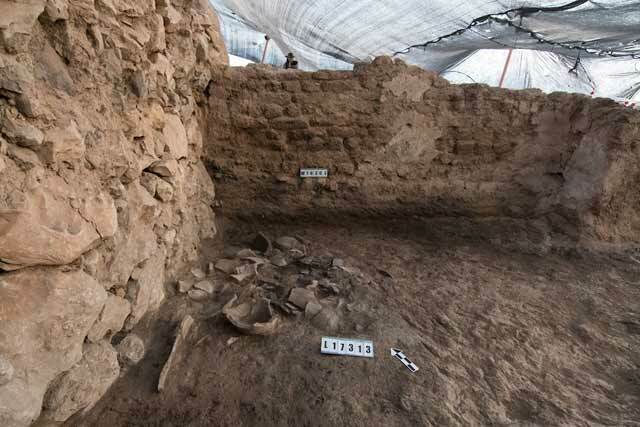 The excavations are sponsored by the Philip and Muriel Berman Center for Biblical Archaeology at the Hebrew University of Jerusalem and by the Israel Exploration Society. The 2017 expedition benefited from the financial assistance of the Selz Foundation (New York), the Edith and Reuben Hecht Fund (Israel), the Steven B. Dana Archaeology Fund and individual donors. 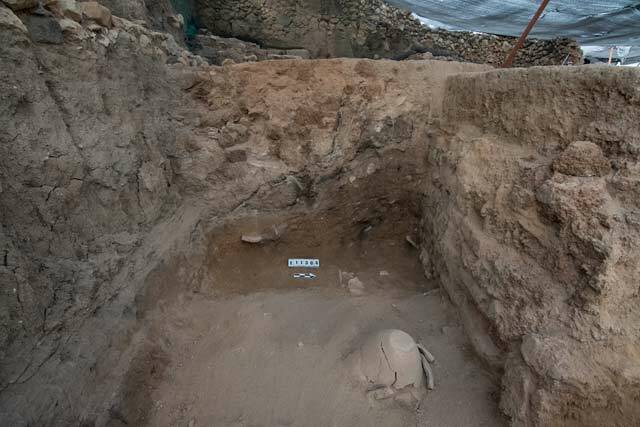 The excavation was directed by A. Ben-Tor and S. Bechar (Area M3 supervisor), assisted by S. Greenberg (Area M3 assistant supervisor). Additional assistance was provided by N. Terchov (registration), I. Strand (surveying and drafting), M. Cimadevilla (field photography), I. Strand and O. Cohen (restoration), Y. Sfez (wet sieving and picking) and S. Yadid and E. Hoffman (administration). The expedition numbered some 50 participants from Canada, South Africa, the U.S., Europe, Australia and Israel. 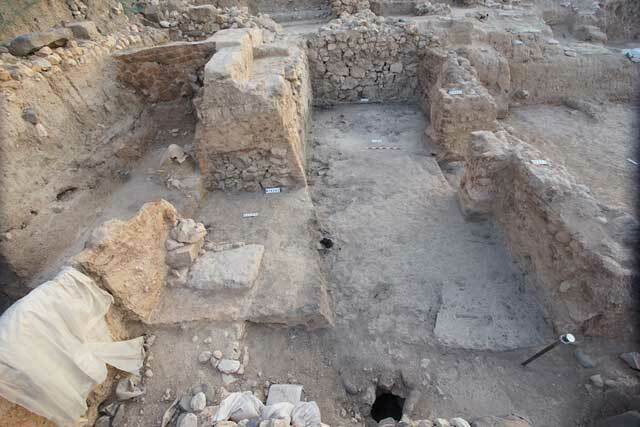 The excavations are conducted in the Tel Hazor National Park with the full cooperation of the National Parks Authority. The expedition was housed at Kibbutz Gonen. Area M3 was the main area of excavation in 2017 (Fig. 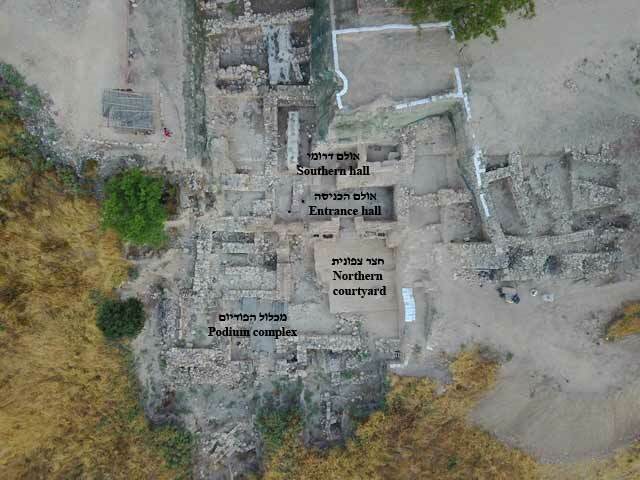 1); it is the extension westwards of the excavations conducted in previous seasons (Ben-Tor, Zuckerman and Bechar 2015). 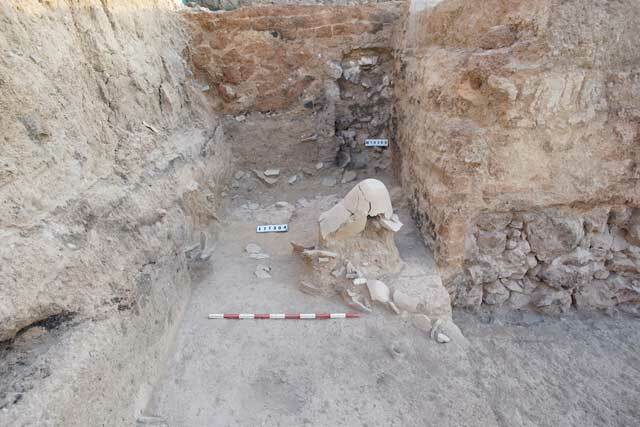 The aim of this excavation season was to unearth the floors of the Late Bronze Age administrative palace and of the courtyard which spans to its north, and to connect these features with their corresponding strata previously exposed in areas M1 and M2, to the north and east. The stratigraphic phases exposed in 2017 comprise two from the Late Bronze Age—the main level excavated this season—and one later phase, from the Iron Age II (ninth century BCE). Two sub-phases were identified in the administrative palace: a construction phase and a deterioration and destruction phase. The Construction Phase (Phase Xb). The administrative palace was built in this phase. Although not fully uncovered, the large courtyard and the monumental basalt staircase leading to the entrance of the palace should be attributed to this phase as well. At the end of the excavation season, a step in the staircase, which also served as a threshold for the entrance hall of the palace (Fig. 2), was exposed. The staircase is much wider than the basalt stairs unearthed in the 1990s in the podium complex (Area M1), to the northeast. The step comprises two basalt slabs, whose dimensions do not fully fit the entrance to the building, possibly due to the location of the base of the staircase, which has yet to be uncovered. This phase includes the monumental walls of the building and the northern walls, which mark the northern limits of the courtyard that extends to the north of the building. Two halls belonging to this phase have been uncovered. The entrance hall is entered from the north, by way of the monumental staircase described above. Almost all its walls were coated with light-colored plaster. The hall’s exit was set in the southern wall, but not along the same axis as that of the entrance. A similar phenomenon is known at other palaces in the ancient Near East, such as the Zimri-Lim palace at Mari and the two Late Bronze Age places—the Royal Palace and the palace in Area K—at Qatana. The southern hall is located to the south of the entrance hall. The wide mudbrick wall (W11-302; covered with a white plastic sheet in Fig. 1) may have also been built in this phase, but it might be a later addition, in which case it should be attributed to the next phase. The northern courtyard was built during the first phase of the palace. 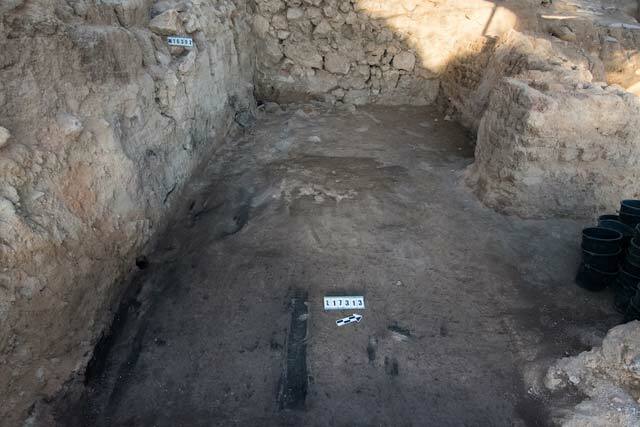 It has been uncovered so far only in the eastern area (M1), but its floor was not exposed. In the western part of the destruction layer covering it, a concentration of large stones was uncovered; their purpose remains unclear. The Deterioration and Destruction Phase (Phase Xa). During the final phase of the building, several walls were built, pointing to a crisis that took placed prior to the destruction of the palace. All the Late Bronze Age finds from the current season can be attributed to this phase. Several samples were taken from contexts attributed to this phase—the entrance hall, the southern hall and four installations near the entrance—for the purposes of the ‘fish and chips’ project, which seeks to study the consumption patterns of the site’s residences in different periods. The entrance hall. The destruction layer was partly exposed in the 2016 season, when mainly burnt and fallen mudbricks were unearthed. The 2017 excavation exposed the great magnitude of this destruction level, which is at least three meters thick. It contained complete burnt wooden beams (some measuring 1.5 m long); the beams in the western part of the hall were found in a north–south orientation (Fig. 3), whereas those in the eastern part were found in an east–west orientation (Fig. 4). 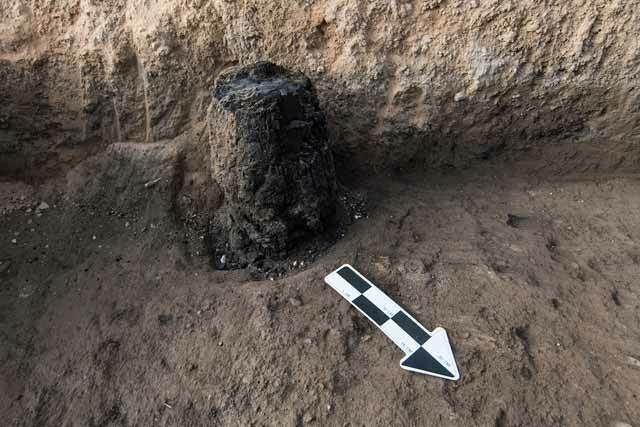 Even a partially preserved burnt wooden pillar was found in situ (Fig. 5). This destruction level also consisted of enormous amounts of pithoi sherds (Fig. 6). Since these sherds were found below the mudbrick material and among the burnt wooden beams, it is possible that the pithoi were placed on the roof of the entrance hall. A more plausible original location for the pithoi would be on the upper level, which was roofed. This can explain why the burnt wooden beams were found both above the pithoi sherds and below them: those found above the pithoi were part of the roofing, whereas those found below them were part of the floor of the upper level and the roof of the entrance hall. During the destruction of the palace, the wooden beams collapsed into the entrance hall, carrying the pithoi with them. Consequently, the pithoi were shattered one on top of the other and found within the destruction layer of the entrance hall. The southern hall. The destruction level was exposed in 2016, immediately below the complex of standing stones dated to the tenth century BCE (Bechar and Ben-Tor 2017). In 2017, the destruction level was further exposed in the northern part of the hall. The finds comprised mainly burnt mudbricks in the northwestern part of the room and ash and burnt wooden beams in its northeastern part, all sloping to the south (Fig. 7; the entire eastern part of the room was fully exposed in 2012 and 2013, but the southern part of the room has not been unearthed yet). Excavations in this room exposed the eastern face of a wall (W16-306; Fig. 8) that should be attributed to the deterioration phase of the building. The wall is built in a haphazardly manner: the lower part of the wall is made up of stones that were carelessly and unsystematically piled on top of each other; Wall 16-302 encircles the stone foundation of this wall. Several pottery sherds and broken basalt vessels were found beside W16-306, as was the case in the 2016 season (Bechar and Ben-Tor 2017). Noteworthy finds from this room are a complete rectangular basalt bowl, a broken basalt bowl and several basalt objects of unclear use, including a broken orthostat. Some of the objects seem to be only partly worked, suggesting that the room served as a storage room for the workshops of the palace. Two very large shattered basalt grinding bowls were unearthed in the eastern part of this room in 2012 and 2013, along with three commercial storage jars filled with a yellowish material, numerous seashells, scoops and a pithos-like flask (Ben-Tor and Zuckerman 2014). This room was reached from the entrance hall through an opening in W16-302. In the last days of the palace, this entrance was reduced in size, with the construction of a very narrow mudbrick wall (W13-301), having the width of a single mudbrick. The wall abutted a large rectangular limestone slab (Fig. 9, W13-301 is covered in a white plastic sheet), similar to the one uncovered in 2016 in the southwestern room (Bechar and Ben-Tor 2017: Fig. 2); the function of these stones is unclear. The entrance space comprised the large staircase at the entrance to the palace, of which only the upper stair was exposed, and four oval installations. These were built of several rows of stones leaning against Walls 16-307 in the west and 3381 in the east (see Fig. 2); the function of these installations is not fully understood. A fifth installation was previously exposed in area M1. In the westernmost (L17-319) of the two installations leaning against W16-307, a complete burnt antler of a fallow deer was found; it crumbled when removed. Beneath the antler were flat stone slabs, most likely part of a drain channel, which was found in the eastern installation as well. The function of the two installations leaning against W3381 is even more puzzling. The western installation had two layers of stone paving. The top paving (L17-321) was made of loosely fitted stones, whereas the bottom one (L17-327) was made of tightly laid stones; the latter may have been part of the courtyard’s paved floor, which was used as a foundation for the installation. Loosely fitted stones were found in the eastern installation as well. 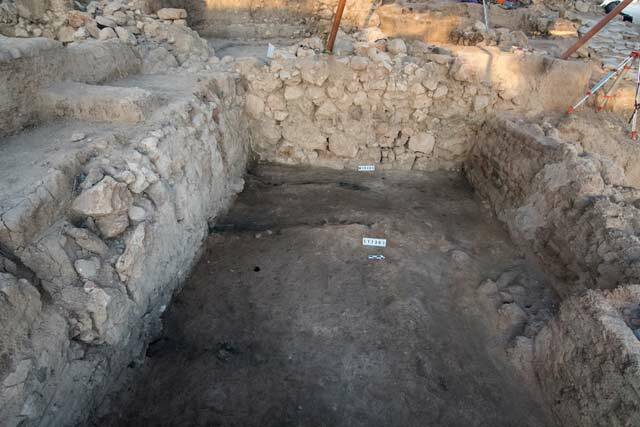 The excavation in area M continued to unearth the ninth-century BCE fortification system. In the ninth century BCE, the city of Hazor extended eastward, into the area designated Area M. This extension comprised the construction of at least two tripartite storage buildings and the solid fortification wall (Ben-Tor and Zuckerman 2010; Ben-Tor and Bechar 2016). A segment of a wall was exposed at the beginning of the season, but it could not be related to any other architectural element. As its elevation was similar to that of the foundation stones of the solid fortification wall, it seemed to be part of the fortification system of the ninth century BCE. This fragmentary wall was preserved only three courses high, as was another fragmentary wall found to its west, which aligned with one of the ‘towers’ of the solid wall. The bad state of preservation of these walls stands in stark contrast to the pristine preservation of other elements of the fortification system. It thus seems that the two fragmentary walls formed the top part of the rampart, which was laid to the north of the fortification system in this part of the city. The rampart, which was not fully removed this year, continues for at least another 1.5 m below the elevation of the fragmentary wall. The ceramic assemblage found in the loci related to this wall all date to the Iron Age II. Bechar and Ben-Tor 2017. Tel Hazor – 2016. HA-ESI 129. Ben-Tor and Zuckerman 2010. Tel Hazor – 2010. HA-ESI 122. Ben-Tor and Zuckerman 2014. Tel Hazor – 2013. HA-ESI 126. Ben-Tor, Zuckerman and Bechar 2015. Tel Hazor – 2014. HA-ESI 127. Ben-Tor and Bechar 2016. Tel Hazor – 2015. HA-ESI 128. 1. Aerial view of the excavation area at the end of the 2017 season, looking south. 2. The entrance to the palace and the four installations, looking south. 3. Burnt wooden beams in the western part of the entrance hall, looking west. 4. Burnt wooden beams in the eastern part of the entrance hall, looking west. 5. Burnt in situ wooden pillar, looking south. 6. Broken pithoi in the northeastern corner of the entrance hall, looking north. 7. The destruction layer in the southern room, looking west. 8. The destruction layer in the southern room and W16-306, looking west. 9. The entrance hall and the southern wall, looking west.